Mrs. Alicia Medina, with her 80 years old, is still creating, together with her daughter María Josefa; must make 500 bouquets. The operations are increased to control the sale of fish in good condition and so that sellers do not speculate with the price. The Catholic Church begins days of reflection, confession and a lot of religiosity. Since Thursday at her home in the town of Paurito, Mrs. Alicia Medina (50) and her daughters María Josefa and Bartola Farell Medina started weaving palm tree buds to decorate them with flowers, since in the Santa Cruz cathedral they have ordered 500 pieces to be distributed tomorrow, from 6:45, before the procession of Palm Sunday, which will start the Holy Week. At the age of seven, Alicia learned the art of weaving the saó palm to make hats, baskets and other utensils for the home. Her inspiration was his grandparents Felipe Medina and Asunta Hurtado, who made their living doing these crafts that have given the stamp to Paurito. During Holy Week, Doña Alicia stops making hats to create crosses and other ornaments with religious motives, which she sells between Bs5 and 10 outside the temple of her town. 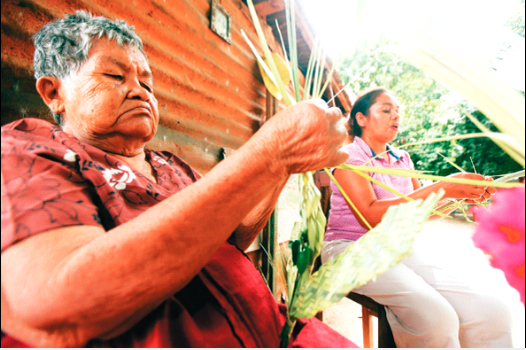 Another craftswoman from Paurito with experience in palm weaving is Editha Vargas (72), who also started crafts at an early age, with whose sales she raised her two children. Now, sitting in the corridor of her house, she rushes her hands to make bouquets that she will sell in the temple of Cotoca. Likewise, Delfa Saldaña is also an expert in braiding saó, who change hats for crosses this holiday season. She does not leave Paurito, where in the atrium of the church she sells her bouquets in Bs5, because of having a lot of competition, she has to sell them at a lower price. In Easter the food also varies, therefore specialized personnel of the Mayor’s Office and the Departmental Health Service (Sedes) is monitoring the sale of river fish from other departments and Argentina, and seafood from abroad, as well as that the sellers have their health card. Nicole Bruno, Headquarters Food Safety, said that the days of Easter are intensifying operations to see the production, preparation and cold chain that reaches the buyer who consumes that food. In turn, Óscar Montaño, Consumer Protection of the commune, yesterday proceeded to paste the official price list in the Florida and Los Bosques markets, as well as authorized sites such as the fourth ring and Virgen de Cotoca avenue. At 6:45 the procession begins from the parishes towards the cathedral. At 7:00 it will be the blessing of palms in the atrium and at 7:15 the mass begins. It is Holy Tuesday, it is celebrated with the Chrism Mass, at 7:00 p.m. The main celebration will be in the atrium of the cathedral, from where the procession will depart, at 18:00, through the center of the city. This entry was posted in Bolivia, Holidays, Santa Cruz, Tourism and tagged Catholic Church, Catholic Festive Day, Easter, religion. Bookmark the permalink.